To write this picture, Gérico received a special permit to work in the royal stables, located in Versailles. The artist spends in the stables for six to eight hours, watching the behavior of animals. Particular attention is paid to work on individual fragments of the figures of horses, depicting them with the utmost precision. For several days the artist was busy with drawing manes and tails separately, carefully writing out almost every hair in order to clearly convey its texture. Do not forget that Gericault was fanatically betrayed to horses, considering them the most graceful and perfect in terms of body proportions of beings. The motif chosen by the painter aroused bewilderment in artistic circles. For the first time the work of art was… horse groats. Moreover, Zheriko found this angle so picturesque and self-sufficient that he did not add any explanatory details. For this reason, critics considered it a special impertinence to erect the motif of this painting to the rank of “noble”, meeting on the canvases of historical and mythological themes. However, the artist himself has repeatedly argued that the theme is secondary, the main thing here is the style and technique of performance. 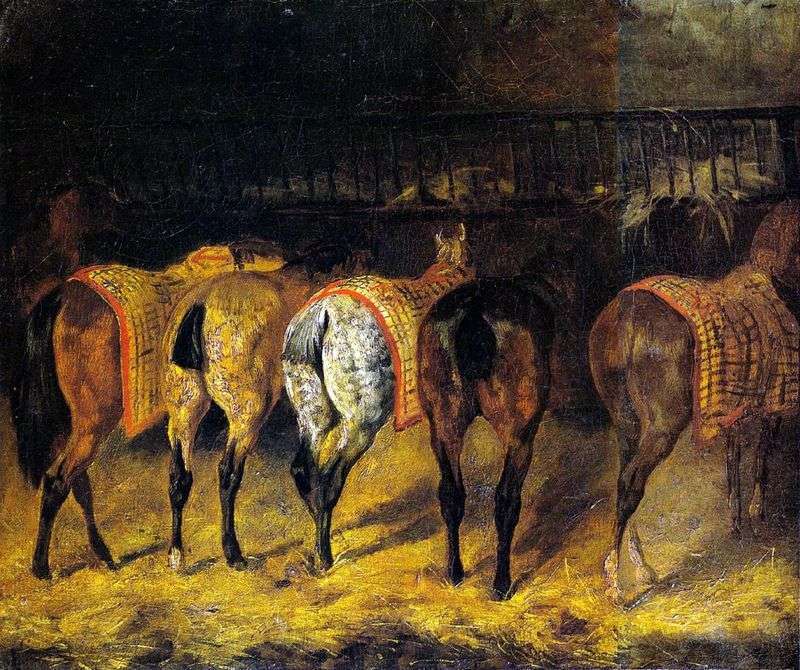 Description and meaning of the painting Five horses, rotated by groats, in the stables by Theodore Gericault.